Based on the 8300CD, the 8300CDQ utilises the existing technology of its predecessor offering all the same level of detail, transparency and dynamic range. Silver version also available. Earn 1095 loyalty points when you order this item. Audiolab 8300CDQ in sleek black is an excellent CD player and a superior external DAC/digital preamp allowing you to exploit your CD collection. While hugely boosting sonic to digital audio sources, like the 8300CD, it stretches resolution to 32-bit/384-kHz and DSD compatibility. 8300CDQ now includes award-winning British MQA technology to play back MQA audio files and streams, delivering the sound of the original master recording. The MQA file is completely validated and minute enough for streaming or downloading. The 8300CDQ adds complete digital preamp operation with volume and source choice accessible via the front of the player and remote handset so 8300CDQ can be linked directly to a stereo power amp or a set of monoblocks such as 8300MB, as well as conventional integrated amps like 8300A. 8300 Series controls music playback from a PC/Mac/media device via USB. When connected to a PC, the 8300CDQ functions as an asynchronous DAC and HID (Human Interface Device) for driverless control (i. e Play, Pause, Stop, Track Select functions). The exterior structure of the 8300 range follows the design aesthetic of Audiolab's new products with softened lines and textures while maintaining the signature contemporary style. The 8300 series’ blasted aluminium finish, CNC routed aluminium dials and display certainly look cutting-edge, yet with every Audiolab product, form follows function. The fresh screen and controls allow quick and simple access through the broad routing methods and filter settings in the 8300A and 8300CD. Audiolab’s extensive research and development found that previous tray-style mechanisms sometimes produced a rare weak spot. The 8300CDQ sports a new mechanism that includes slot loading – much quicker and neater than the old tray. The new mechanism also prevents the incidence of disc refusal as it is able to play CDs that other players may not due to imperfections from dirt or damage. The digital buffer circuit is an ideal companion to the DAC’s asynchronous input enhancing even this aspect of performance. Reinforced disc stability and lower susceptibility to resonance backs the complete augmented sound quality. 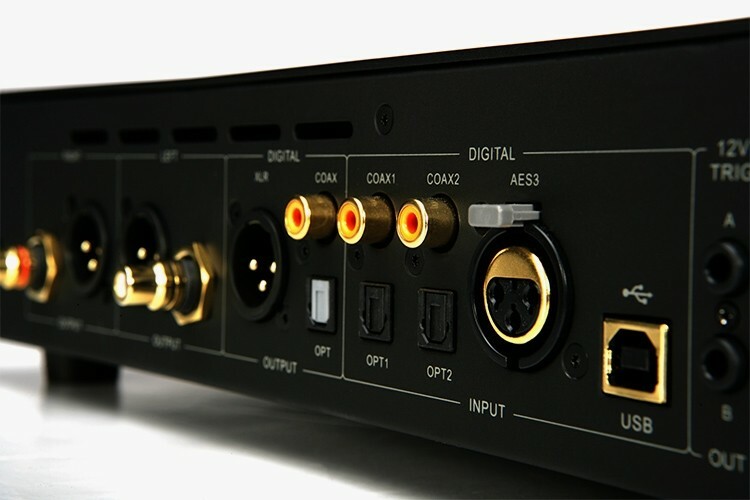 Connectivity is expanded on the 8300CDQ via the inclusion of an AES/EBU digital input and XLR digital output rounding up a full array of inputs/outputs derived from the 8200CD: Twin digital coaxial and optical, asynchronous USB, single-ended RCA and analogue balanced XLR. A remote 12V trigger incorporated on all units allows paired units to be switched in or out of standby mode in unison for quick operation. 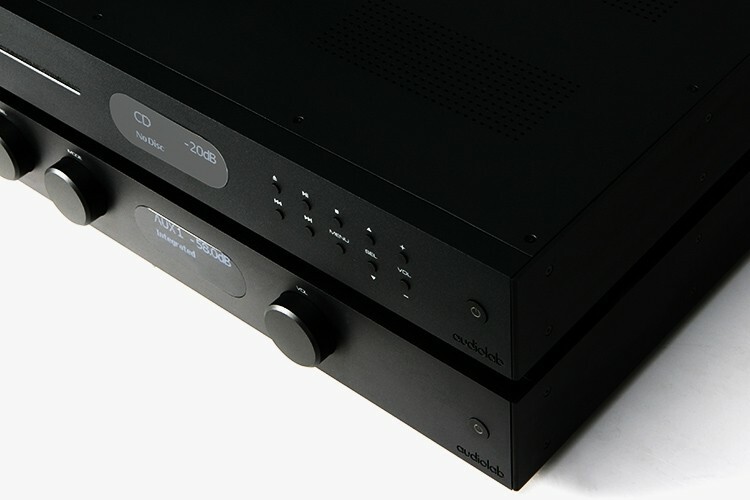 8300CDQ preserves it reputation for the best-sounding DAC function through its use of a 32-bit ESS Sabre DAC, typically only found is designs that cost substantially more. The distortion measures are extraordinarily low. Around the DAC there are extensive measures to reduce jitter to vanishingly low levels, of a nature you’d expect to see only in much more expensive players. Audiolab 8300CDQ’s process of conversion results in the 512 DAC components (256 per channel) functioning at 84.672MHz with digital audio sources upsampled or oversampled to this frequency regardless of sample rate. Consequently, switching is 3840 times higher than the standard 22kHz audio upper bandwidth. Without digital upsampling, the analogue filters may affect frequencies at or close to audible range, producing unwanted level and phase variation. Hyperstream modulator achieves peak transient response removing dynamic response defects and noise floor tone artefacts usual of conventional Delta-Sigma DACs. 8300CDQ can facilitate and handle data up to 32-bit/384kHz; a much greater spec than is required by current hi-res music formats, so 8300CD is ready for future advances in UHD digital sound. The USB input now supports DSD on top of PCM, a vital inclusion as DSD helps develop high-res digital download scene. The filter section has four additional filters for DSD to optimise the noise floor to the source file and the bandwidth of amplifiers and loudspeakers. The uprated digital processing associated with the increased resolution at the USB input delivers additional sonic benefits, for both CD replay and other connected digital sources, whatever the resolution of the file. The Sabre DAC and processing of data increases independent resolution of audio detail and dynamics delivering more energetic and transparent performances at a new benchmark for CD players at this price. With the progression of digital audio technology, the significance of digital filter reconstruction characteristics have become more valued. The Audiolab 8300CDQ features user-selectable digital filters for optimal listening. These filter settings allow the user to tune the 8300CDQ’s performance to suit his or her preference, depending on system configuration and musical taste. 8300CDQ also adds four DSD filters that progressively attenuate the out of audio bandwidth noise floor. With secure, wide-bandwidth amplifiers and loudspeakers handling high power output, you can choose the broadest 70K bandwidth setting. More modest equipment will benefit from the lower bandwidth settings, as may files that contain little or no recorded ultrasonic musical detail. The amplifier functionality is built around the new display ensuring simple yet in-depth control. Easily navigate around the multi-purpose configurations offered. 8300CDQ can behave as an integrated, power, pre and a split pre-amplifier - seamlessly coupled with numerous hi-fi systems. Vital elements processing audio and power supply are fully isolated as far as possible. ACD (Active Current Delivery) ensures totally clean sound up to the point of clipping, then enhanced microprocessor restricts the output even at its louder output of 75W RMS.